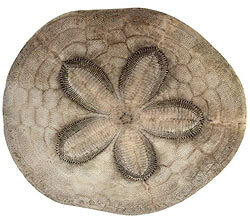 The Sand Dollar is a spiny, hard-skinned Echinoderm shaped like a flattened disk. They are green, blue or purple with a velvet-like texture and appearance caused by their spines. They live on the sandy or muddy sea floors, from the intertidal zone to the subtidal zone, usually at depths of 9 to 12 m. They burrow under the sand with an edge poking up out. They are often found in large numbers living together. They have a hard skeleton (called a test) made of calcium carbonate plates. The underside contains the mouth, many black spines and the cilia. They have tiny tube feet that used as gills. 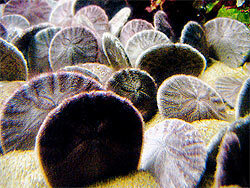 Sand Dollars eat plankton and tiny particles of food that float in the water. Their predators include sea stars, snails, and skates. Sand Dollars are either male or female and egss and sperm are released into the water column. The free-swimming larvae metamorphose through several stages before the test begins to form and they become bottom dwellers.